Hi Cheepsters! In the interest of sanity I’ll be taking a break this week. Christmas Crazy has taken hold here and that’s using up all my brainpower. I wish you all a happy holiday of your choosing, and very much hope that you survive any parking lots you happen to enter. People be ANGRY out there, so remain calm and try to stay out of their way! It’s another roast week, with pork being the big winner. If you’ve got a smoker, you can feed a lot of people on the cheap this week with a pork shoulder. If you’re more of an oven-roasting sort, pork loin roasts, both bone-in and bone-out are under $2/lb. Remember, if you see a great sale, post a comment or let me know about it on the Facebook page/twitter. Especially with the holidays we’re all looking for great ways to save! Randalls entire front page this week is roasts, none of which hit a price point I’d suggest buying. Usually they’re more on the ball with their loss-leaders, since it’s the only reason sensible people walk in the door! Fiesta’s got a hog head in the freezer if you need one, 99c/lb. Please share your photos with Cheepie if you decide to do this! It’s good for tamales, and if this is why you go buy one, I’m happy to taste-test. Just let me know where and when. Berries and apples are the fruits my kids will be eating this week. I’ll also be buying pork tenderloin for a dinner this week and for the freezer. At Fiesta I’ll be getting spare ribs and black beans to stockpile. The bulk sale at Sprouts will be a great way for me to stock up on some of the things I need for cookies and granola bars: nuts, seeds, fruits. I hope some of these sales are for things that you need for the pantry or freezer. Here’s the full list! Yes, an old photo. My mailman still doesn’t like me. HEB has a weird thing going on with shrimp at the grackle vs. non-grackle HEBs. I’ll write it up for tomorrow. I’ll leave it as an exercise for the reader in the meantime. I know you Cheepsters love a puzzle! The Trail of Lights goes live today, with free nights until Dec. 15th. The free nights are likely to be crowded, but given how much you might spend on a shuttle/admission/funnel cake/ferris wheel combo, braving the crowds is the frugal option! They’ve got a light show on the hour from 6-11pm. The Wimberley Trail of lights is at the Emily Ann Theater and is free. The Minor Mishap Marching Band will have absolutely no holiday music to share as they celebrate the holiday season as only they can! Minor Mishap is also holding a lantern parade on Dec 21st. Location is TBA so follow the event on Facebook to join in the fun. The Central Presbyterian Church has a long-running free concert series every Thursday at noon. This month is all holiday themed, with this week’s performers The Austin Handbell Ensemble. It’s a short, lovely concert, perfect for families, and you can order up lunch for just a $5 donation ($3 kids). A light show, carriage rides, and carolers are all scheduled nightly at the Domain. Have you got a free holiday link to share! Let Cheepie know! I am fairly certain that I did an actual double-take when I saw this. This is twelve times what I look to pay for a kiwi. 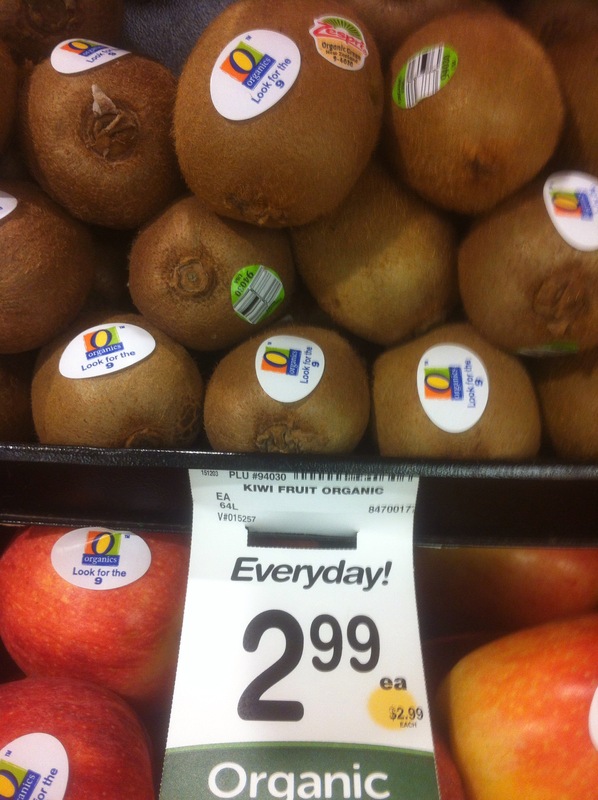 Who is buying these kiwis? I feel like Randalls will end up tossing them and the best case scenario is a lucky dumpster diver gets a treat of mushy kiwi. I do not understand pricing sometimes. Was there a kiwi blight? Many happy returns of the day, Cheepsters! I hope you’ve all had a great holiday weekend and are looking forward to a December full of merriment. I’m here to make sure you can feed the people that show up at your place for said merriment. This week is thin on the ground, because stores are trying to recoup during the brief lull between Thanksgiving and Winter Holiday of Your Choosing. Grocery stores don’t actually work on a large markup but more on a tiny markup on volume, so it’s time for them to recover from all the deals on turkeys, potatoes and cranberries. What I am looking forward to is eggplant, pears, rice and avocados, which are all easily turned into lovely snacks for when friends stop by. They’re also having something called a ‘Fab!5 sale’ which involves a lot of products and you should check the ad if you shop there. Take care and stay tuned for the holiday specials. Please add any great deals you see on baking goods, trees, or anything else holiday related! Let’s get our Advent on! Cheep cheep!